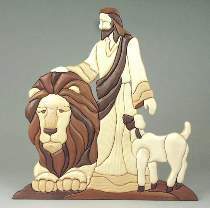 You get two projects in one - Jesus with a lamb and lion, a symbol for the coming peace on earth, and Jesus with His Flock (not pictured) from the 23rd Psalm - The Lord is My Shepherd. Intermediate level. Approx. 96 pieces. Measures 18"H x 17"W. Patterns for both projects drawn FULL SIZE.